A day to celebrate tea time with friends and pretty tea cups! Halloween is only 8 days away...already! My decor choices are turning darker...to black, and gold. So I went to my china cabinet and pulled out a cup I often use in the fall. She is black, gold and beautiful on the outside! And light and feminine on the inside....lovely gold gilding. ...Beautiful with a little poesy of roses and wildflowers... so romantic in such a dramatic cup. I do swoon over the gold pretty detail! She wears a simple gold handle, just the right size and shape for a comfortable hold. 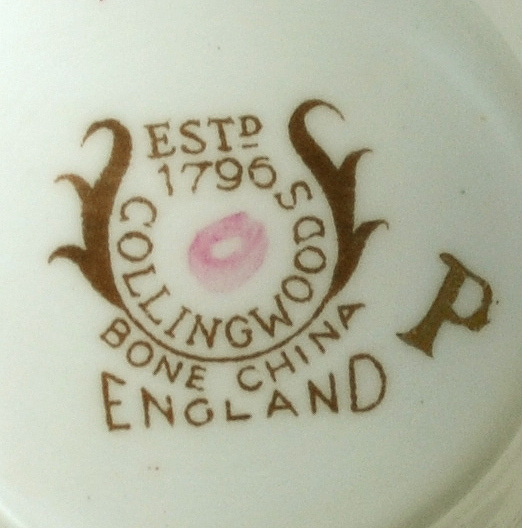 The backstamp on the bottom is clear...this cup was manufactured by Collingwood. 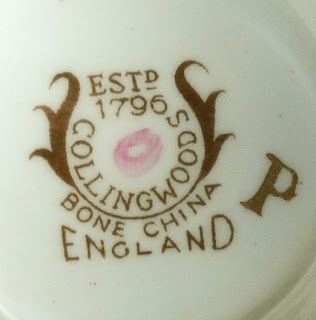 Collingwood Bros., (formerly Collingwood and Greatbatch) china company began in 1887 and used only an impressed mark of their name until just around 1900, when they began using printed marks. They were situated in Longton. Stafforshire Potteries. This mark above was used between 1937 until 1957. You can also see a little pink smudge in the center. It almost looks like nail polish. did not reveal anything to me. Boo hoo! 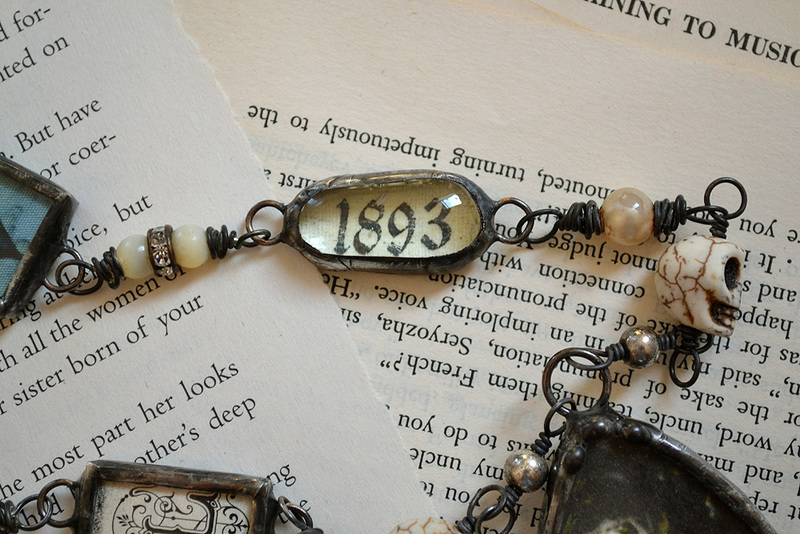 I recently finished a special necklace for a friend. but Beware...it is a little creepy! If you would like to join in Tea Cup Tuesday...just go and create a post with a tea cup in it you would like to share and come back here and link up below with Linky Tools. Martha and I do so love visiting you and seeing your tea cups and tea time. Thank you so much for stopping by for a visit...I love reading your comments! I am looking forward to the full unveiling of your necklace, I am intrigued. Your teacup is so beautiful. I love the gold pattern. Can't wait to see the bracelet. Gorgeous tea cup and saucer. I don't run across such treasures very often. My teacup and saucer today is from a time when ashtrays were politically correct. Your teacup is truly stunning! I love everything about it. The shape of the cup, its pedestal, the black and the ornateness of the gold, makes it very swoon-worthy! She's a beauty and thank you for sharing her with us. Hope you're off to a lovely week, my friend. Hello Terri, wonderful teacup! Very luxurious. The bracelet looks so lovely, I want to see it complete. Thank your hosting again! Today I join with two posts. Let me know when you get tired of children's cups... I know they are not exactly the party's theme. And your necklace--OHHH I saw it on facebook around the neck of Marlynn-it is just fantastic, I love all the components you used. thats a luxury cup. 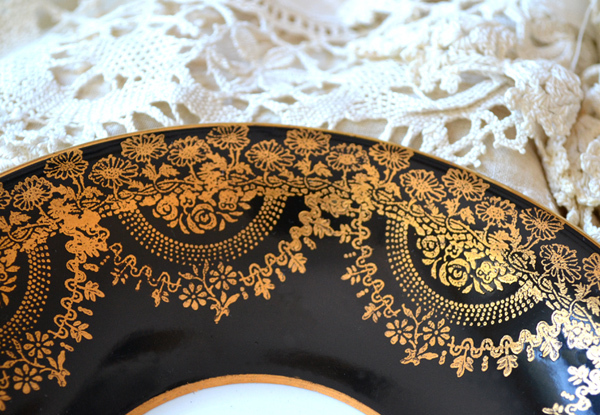 I love the dainty doily gold decorations. They are so beautiful done. And the sweet posy adds some charming colors. It is truly a treasure. I am thrillend about the neclace you made. A bit scary but just right for the season. Thank you for sharing your treasures and for hosting this sweet event. Happy Tuesday to you ...hugs! 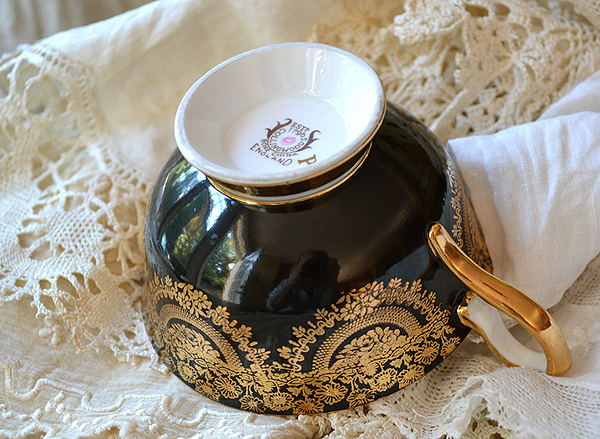 Terri - Always ALWAYS the most spectacular tea and china finds in your posts! You have educated my taste when I'm out antiquing or thrifting in so many ways. This week's cup is truly elegant! Like that little black dress with all the just right jewelry! Thanks so much for hosting and sharing so much with us . . .
Another winner, Terri! Dark and mysterious on the outside but colourful and gentle on the inside with its lovely bouquet of flowers! Certainly a cup fit for a queen! Terri, your cup leaves me speechless! Recently I picked up two cups in my favourite 'retro' shop and they had what appeared to be nail polish markings on them. I thought that these may have been added by their previous owner? Am I being too simplistic? 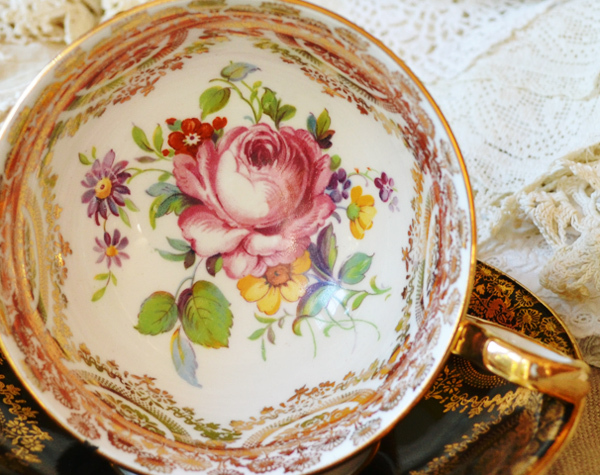 Beautiful and delicate teacups - gorgeous photos as always - I am back for Tea on Tuesdays, after much time away from blogging - drop by if you get a chance!!! Terri, you have wowed us with this cup and saucer! The detail on this one is spectacular. I love the gold against the black background!The center with the beautiful flowers is the icing on the cake. I have seen this mark before and always enjoy the quality of this china. Do you have other cups and saucers from this factory? Thanks for hosting and sharing your lovely cups and saucers! A lovely teacup. I love the gold overlay as well. The black is such a nice contrast tot he pretty floral. Lovely! 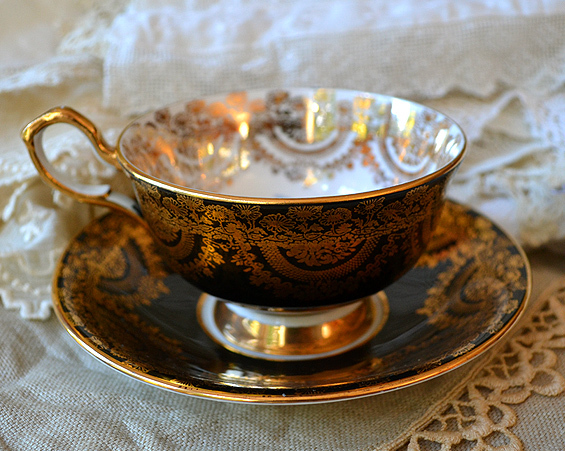 Such and exquisite and elegant Tea Cup. What great collections you have. I love the information you provide as well. Dear Terri, even in this case I cant worthwhile as regards the P. .. The duo is nothing short of opulent, rich and eye-catching ... Wow, what an elegant tea party, must be hosted in those years! Love, love everything about tea! hi Terri, such a beautiful cup.... amazing!! and I am looking firward to the creepy necklace!! Hi Terri, I don't think I've ever taken the time to tell you how much I love your posts and your gorgeous tea cups. I always enjoy stopping by to visit. Oh wow..this cup is totally me! I have never ever seen one of these beauties before! Wowness! Very unique ..dazzling to look at..and full of mystique! I am soo super-smitten!! This is magnificent!I will have to hunt for one fo these! Those little skull beads are all the rage with college girls so necklaces and bracelets are sold at lots of gift shops around the campus where my daughter goes to school. Spooktacular! LOVE the teacup you are featuring...wow, it is stunning. Thx for hosting and have a great week ahead. Hi Terri.. Thanks for the head's up about my site being slow to open... I worked on and tweaked a few settings ...hopefully , that will help.. I understand large photos will hinder that as well, I discovered the use of the break page read more on a new page symbol on the task bar above each post. I always wondered how to use that! Love your black and gold... exquisite! Your teacup is beautiful! 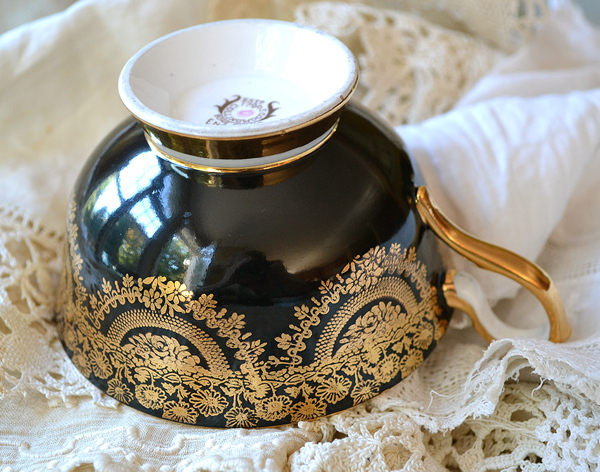 I love the pretty floral design inside the teacup and the black & gold trim. Thanks for hosting! Have a wonderful week. This teacup is awesome, Terri! LOVE the black and gold trim. Can't wait to see your creepy necklace. I'm really curious!!! Hi Terri...I love your cup, she is a beauty indeed. She's so special, I might be afraid to use her! I actually made a few cards this past week and thought of you. You always inspire me. One of the most beautiful and dramatic teacup and saucer sets I have ever seen! 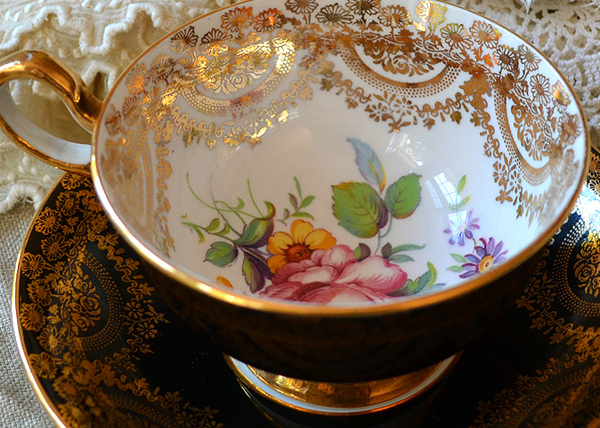 The gold decorations is absolutely stunning against the darker colour of the outer cup and so pretty and delicate inside!. Love the necklace too Terri! What a beautiful and unique teacup, Terri. It is really a stand-out. The detail against the black is magnificent. I love all of the facts you give about it's background too. Great to learn new things. It really is an old one and has managed to survive it all it's glory all this time. What a beautiful dramatic teacup! Thank you for hosting! This wasn't my week of participating in Tea Cup Tuesday - I have it scheduled for once a fortnight :) - but I coudn't help seeing and admiring this beauty. What a luxurious tea cup! You certainly have a gift for uncovering these beauties!